More than 95% volume reduction is quick time. 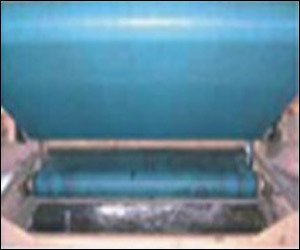 Unique multi-section design eliminates cloth clogging. Intelligent hydraulic loading and mass balance. Helps meet EHS. pollution and ISO 14000 norms. Sludge management takes almost 1/4th of ETP operating cost. Conventional drying beds, filter presses, decanters etc. can not meet the needs. Belt press filter is the answer. KONARK FILTERS' KOBELT-SQ-TWIN is the best answer. 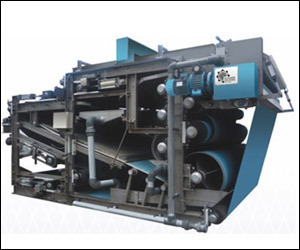 Sludge is dewatered by applying mechanical pressure on conditioned sludge between two tensioned filter belts passing through decreasing diameter serpentine configuration. 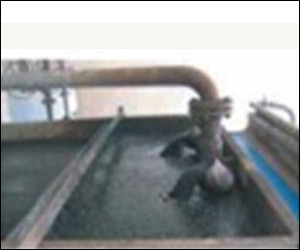 Proper quality and quantity of dewatering synthetic polyelectrolyte is dosed and mixed thoroughly in the incoming sludge. 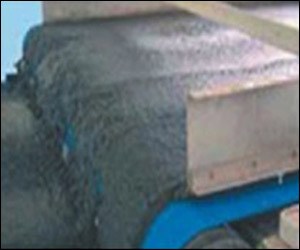 Conditioned sludge is spread fed On the gravity drainage section of the belt. Unique side rubber lips help proper spreadinq of sludge. Maximum amount of free water is effecrlvelv drained out on the long section. Special sludge ploughs and flips are. provided to increase drainage efficlencyofthe Sludge. 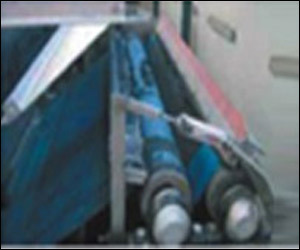 Filtration starts taking place in the gradual wedge formed between the two converging filter belts, The twin filter belts with sludge sandwiched in between converg completely on the first perforated take up roller. 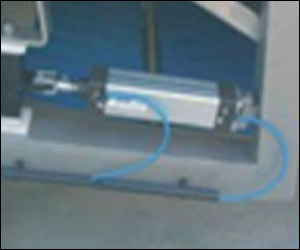 First take up roller exerts an even pressure of about 0.15 kg/sq.cm on the sludge. It further increases in the following rollers. A linear belt tension of about 10 kg/cm is kept applied. 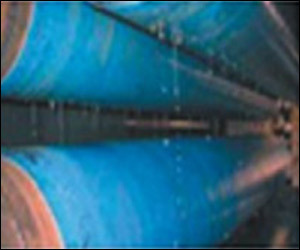 The pressure increases uniformly on the following rollers. Maximum free water is thus intelligently and progressively squeezed out of the sludge. Dewatered sludge is scrapped off from both the belts by argonomlcally placed doctor knives. 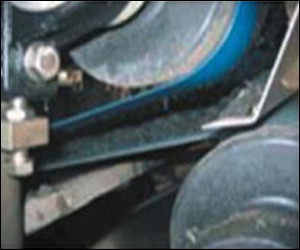 Pressure of the knives on the belts is kept adjusted with the help of tensioners. 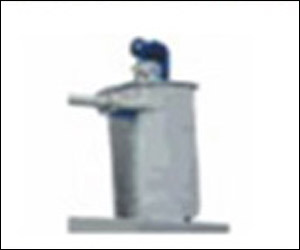 Both the filter belts are provided with deviation sensors and pneumatic correctors. This helps to keep the filter belt. properly aligned to give optimum performance and life.